Industry-leading research and development, combined with extensive testing ensures that our FOAM DESCALER & SANITISER can be used effectively across a whole spectrum of water coolers. This product is designed to be used on a water coolers external fascias, to remove unsightly scale and ensure a hygienically safe machine. SAFER TO USE — Our non hazardous foam alternative eliminates the risk of water cooler operators and users coming into contact with the harmful vapour/mist that is created using liquid descaler sprays, particularly in environments where machines are located near to users and confined areas. EASY TO USE — As our foam clings to surfaces, this eliminates the usual mess created by liquid solutions running down the machine fronts making it easier and simpler to clean. COMBINED DESCALING & SANITISING ACTION — By providing a two in one action eliminates the need for separate products. SUPERIOR DESCALING ACTION — Product generates a thick foam that clings to vertical surfaces enabling the product to descale more effectively than typical used liquid spray solutions. 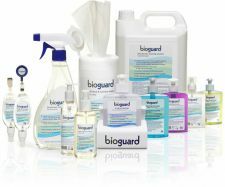 INDEPENDANTLY TESTED— Our FOAM DESCALER & SANITISER has been independently proven by leading UK and European laboratories as being effective against a wide range of bacteria, mycobacterium, viruses and fungi. ENVIRONMENTALLY FRIENDLY — Proven by independent environmental audits to be non-toxic, biodegradable and non accumulative in the eco system. During regular route cleaning or any time you need to remove unsightly scale and or saintise your cooler. Spray foam on to cooler fascias and leave to soak in for 2-5 mins. Wipe off with cloth and leave to dry, no need to rinse!